Hit Man Returns: David Foster & Friends chronicles one fantastic star studded live show in Las Vegas featuring Seal, Earth Wind & Fire, Natalie Cole, Chaka Khan, Charice and many more! 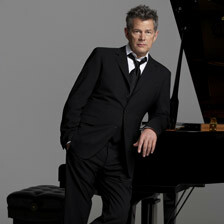 Recorded live in performance at Las Vegas’ Mandalay Bay Events Center, Hitman: David Foster & Friends features Foster himself presiding center stage at the keyboard. The evening is a virtual jukebox worth of songs written by and/or produced by him. Kenneth “Babyface” Edmonds and brother Kevon offer “I Swear”; Brian McKnight revisits Earth, Wind and Fire’s “After the Love Has Gone”; former Chicago front man Peter Cetera gets down with “Hard to Say I’m Sorry,” “You’re the Inspiration” and “Glory of Love”; while Boz Scaggs reprises “Look What You’ve Done to Me” from Urban Cowboy. WSBE Rhode Island PBS airs this spectacular performance on GREAT PERFORMANCES on Saturday, March 5 at 7:30 p.m.